ANNAPOLIS, Md. 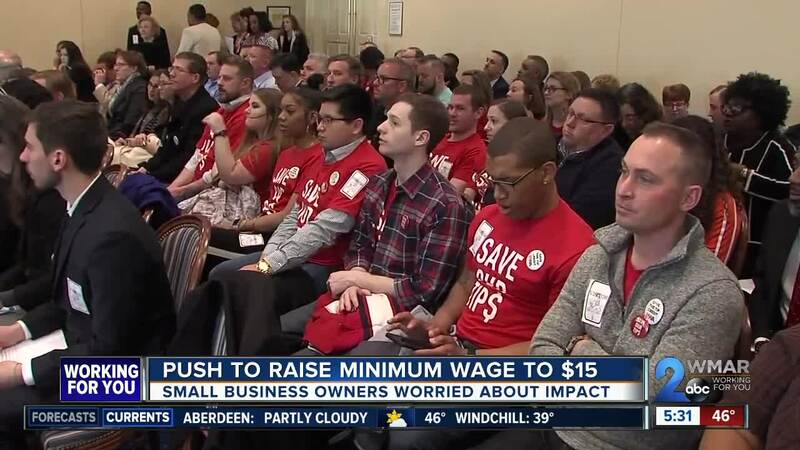 — A packed house, as lawmakers listened to concerns about a $15 minimum wage in Maryland. The new law would increase the minimum wage a dollar a year until it maxis out at $15 in 2023. After that the minimum wage will adjust by rate of inflation. Some business owners say the cost is too high to keep their business profitable. Philip Tulkoff owns a food products business. Tulkoff says when he adds in the health insurance he offers, 401K match and other benefits to his lowest paid employees that currently are making $11 an hour, that $15 an hour would be more like $20 in total expense. “I have 65 hourly employees, times $4, times 2,080 hours a year, that's like $640,000, a year plus the benefits,” Tulkoff said. Kathy Lill is one of the owners of Tidewater cleaning service on the Eastern Shore. Lill said she would have to raise her prices for her cleaning services. “I think the ultimate consequence is that we would not be able to obtain our business,” Lill said. Some workers currently making minimum wage say they hear stories of how hard it is to survive on that salary. “After working three jobs, getting paid $10 an hour, she had to go dumpster diving to get fruit and food to feed her family," said Lydia Walther-Rodriguez of CASA Maryland. Currently the minimum wage in Maryland is $10.10 an hour. Pennsylvania and West Virginia have a minimum wage of $7.25. In Washington D.C., the current minimum wage is $13.25 an hour, set to raise to $15 an hour by 2020.